Teardrop pearl earrings, like so much other pearl jewelry, are true classics. Time tested and always fashionable, they remain an all-time jewelry favorite. Teardrop pearls are known for the naturally eccentric shape. Typically, these are off-round or pear-shaped. Off-round pearls are generally used for dangly earrings or may be strung together as a necklace or bracelet. Why is this particular earring style so popular? Teardrop pearls are incredibly versatile. They are earrings that look terrific with both casual outfits and for special occasions such as weddings and other formal events. Today they more versatile than ever as earrings with teardrop pearls are not only set or decorated with gold but are also available with Swarovski detail and in white gold or silver. 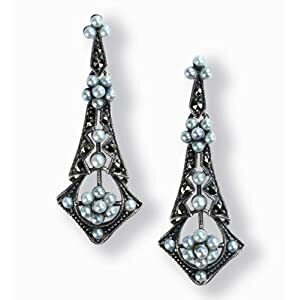 Teardrop-shaped pearl earrings also vary in style and design – the most preferred being long, chandelier-like pearl earrings. The popularity of teardrop shaped pearl earrings dates back to the Renaissance era. In fact, there are a lot of historical portraits which can attest to that. A few examples are – Queen Anne of Denmark by Paul Van Somer, Girl with a Pearl Earring by Johannes Vermeer, La Bella and Venus of Urbino by Titian. These portraits are used as models for many of today’s Renaissance replica collections. But teardrop pearls are not only famous because of these paintings. One pear-shaped pearl in particular, which is known as the La Peregrina is famous because of its provenance – a slave was set free after finding and presenting the pearl to the Spanish Court. The La Peregrina was first owned by Queens Margarita and Isabel of Spain. But its most recent owner was the well-loved Elizabeth Taylor. Like other pearls, teardrop shaped pearls are not only popular with royalty but are also associated with religion. In fact, these pearls are usually found not only in ancient types of earrings but are also found in religious necklaces and bracelets that are considered valuable relics. Because most earrings with pear-shaped pearls are similar to dangle earrings, the same principles apply. 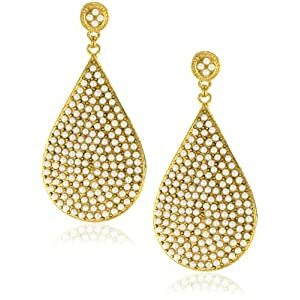 Most people say that teardrop earrings look best when worn by tall women rather than those shorter in height. Tall women have wider space between the earlobe and the shoulder which is why longer and extravagant earrings are a better fit. 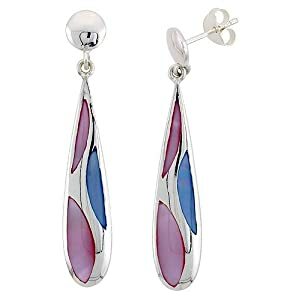 But women with shorter height can also showcase their style with teardrop earrings with shorter or medium length as long as they have a beautiful chin and a perfectly-contoured or well-rounded face. So overall, because of these versatile properties and different available lengths, teardrop shaped pearl earrings can work for women who are either tall or short. 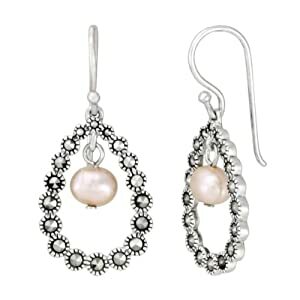 Natural pearls are prized and expensive which is why teardrop pearl earrings are expected to be of high value. 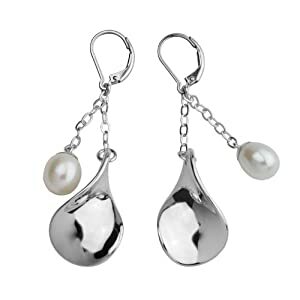 Some teardrop pearl earrings can really be expensive, especially when other precious stones or metals are used. The ones highlighted here are very affordable and great value. With that said, a great way to save money when buying teardrop pearl earrings is to choose simple designs or an all-pearl pair so you can cut extra costs. 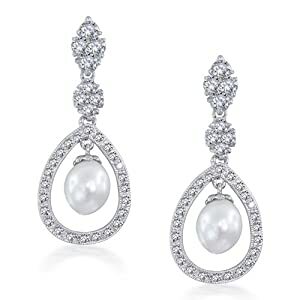 Another money-saving tip when it comes to buying teardrop pearl earrings is to opt for cultured pearls. They are not as expensive as natural pearls but are just as pretty. Looking for a cheap pearl earring?